The Occupy movement spread rather quickly across the U.S., riling up millions of Americans who deemed themselves the “99 percent.” Everyone knows income inequality continues to be a major issue in the country, but the data is pretty mind-blowing. Bolt Insurance has created a new infographic detailing salaries of the 15 highest-paid CEOs, which might be interesting to those interested in compensation trends. 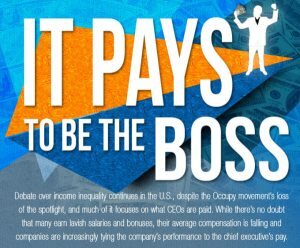 The new infographic, “It Pays to be the Boss,” explains just how much the top 15 CEOs get paid (each receives $40+ million annually), how much their companies earn, and it also describes the new trend of CEO’s pay shifting toward company performance. Although CEO compensation peaked in 2007, they have now decreased, though they’re still about double the amounts seen in the 1980s. At $131, 900, 000 annually, CEO of McKesson John H. Hammergren is the highest paid CEO. McKesson has an annual revenue of $112 billion. Ralph Lauren, CEO of Ralph Lauren, comes in second place with an annual compensation of $66, 650,000. His company, the only clothing company in the top 15, rakes in almost $7 billion annually. Three of the 15 highest paid CEOs come from businesses in the healthcare industry (McKesson, Express Scripts and United Healthcare) and two are from the oil industry (Marathon Oil Corp. and Kinder Morgan). Starbucks CEO Howard D. Schultz makes almost $42 million a year, making him the only CEO of the food/beverage industry to make the list. Performance-based compensation has increased over the past three years, In 2009, 65.3 percent of a CEO’s salary was non-performance based while 34.7 percent was performance based. In 2012, just 49.4 percent of a CEO’s salary was non-performance based while 50.6 percent was performance based.